ERROR: Mail was unable to connect to the Internet. Click the "Network Diagnostics…" button for help diagnosing the problem. This one is fairly self explanatory. 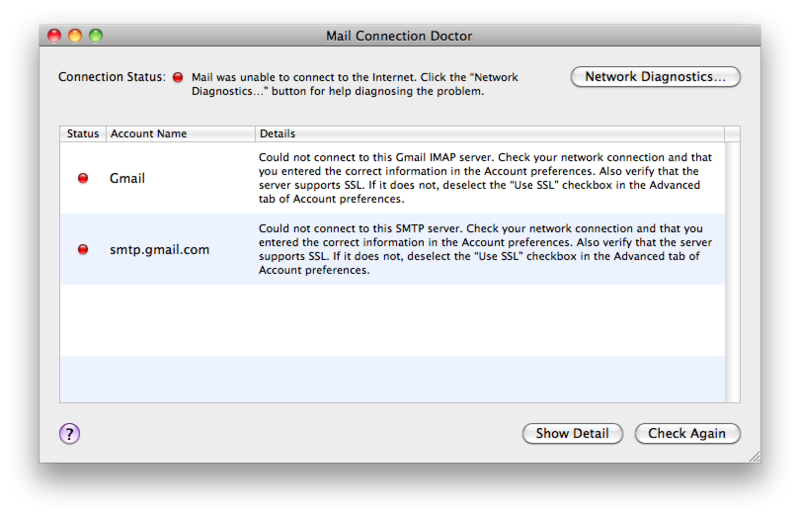 Mail was not able to connect to the internet. This error appears at the top of the Connection Doctor window. The Network Diagnostics will ask a series of simple questions to determine how your Mac is connected to the internet. If it's something simple, it can resolve it. If it's more of a complex issue besides an unplugged cable or dropped wireless, you may need to contact your ISP for further support.